Synopsis: The setting: Razorhurst, 1932. The fragile peace between two competing mob bosses—Gloriana Nelson and Mr Davidson—is crumbling. Loyalties are shifting. Betrayals threaten. 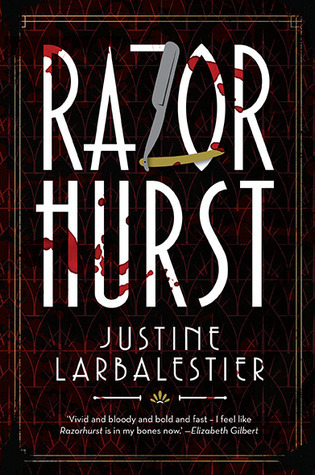 What I Thought: Razorhurst is fast, thrilling, dark and dangerous, and it will leave you wanting more than just the one book. Razorhurst is about gangs and life in an Australian town in the 1930's. It follows the POV's of two girls - Kelpie and Dymphna. Kelpie is a a dirty, malnourished girl who lives on the streets, and can see ghosts. Dymphna is a gorgeous girl who lives a lavish life, and who can also see ghosts. They come together by fate, over a dead body, each already knowing who the other is, and starting on a whirlwind journey over a twenty-four hour period. Yes, this 365-page novel takes course over a twenty-four hour period, and you won't even realise because Larbalestier does such a damn good job of disguising that fact. We get to see behind the curtains of gang life with competing mob bosses, and watch the two girls try and figure out how to stay alive, and out of gaol. Larbalestier also gives us intermittent chapters that give us flashes into each of the characters lives, how they lead up to this point, and how the town and the mob bosses came to be. At first, it was semi-confusing trying to keep up with it all, but once you get into the rhythm of the story, you'll be flying through it like there's no tomorrow. The Good: I loved the background stories, and how everything manages to fit together. The Bad: Both main characters annoyed me at one point, I seriously wanted to strangle them both.